Our communication behavior is undergoing change. People talk to each other digitally and are using new ways of contacting each other. 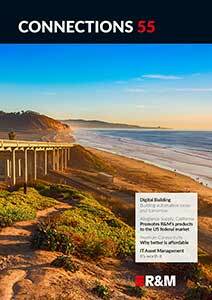 This digital transformation is the lead story in the R&M customer magazine CONNECTIONS. It is impacting the business world. CEO Michel Riva explains how R&M is changing. After about 20 years of the Internet and 10 years of social media it is clear that these media are changing our lives more dramatically than any technology before. The transformation to a digital culture demands diligence from the ICT market and thus from manufacturers such as R&M. It requires a new mindset. New behavioral patterns and standards are thus arising in society, in relationships within companies and with the market. Heterogeneous networks now take the place of closed systems controlled in a top-down approach. And the entire business world has to come to terms with that. Customers and employees are looking for open communication without hierarchies. They want to communicate on a level playing field and be involved. A leading Swiss expert, Prof. Dr. Andrea Belliger from the University of Teacher Education Lucerne, takes a look at digital transformation in the R&M customer magazine Connections. She talks about what companies have to learn and be aware of to be able to make their mark as a brand in the digital era. There is need for action for R&M and for partners and customers in the network sector. 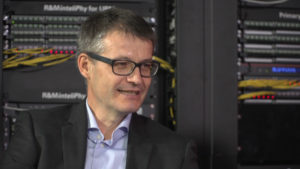 R&M CEO Michel Riva stresses the opportunities this brings with it: “Our solutions are becoming more intelligent with digitalization.” The phenomenon makes it easier to optimize networks and data centers. The CONNECTIONS editorial team interviewed Andrea Belliger together with Michel Riva. In this interview, the CEO also talks about how R&M itself is mastering the digital transformation.